In 200 BC people thought the world was flat. They thought it was flat because it looked flat. Using just the concepts of geometry (point, line, plane, space, and time) Eratosthenes was able to prove the world was round. He did it by measuring the angle that light fell on a wall, at the same time of year (summer solstice), in two different cities (Syene and Alexandria). He knew the distance between the two cities. Using geometry alone he was able to prove the earth was round. He did not need to go to the moon to see it. He just knew. Based on the illustration above, Eratosthenes calculated the diameter of the earth. His calculation was about 10 percent larger than it actually is. Given the time in history and the primitive measurement this was a remarkable achievement. His entire theory was based solely on geometry. During his time people still assumed the earth was flat because it looked flat. This illustration shows that we only have to observe the environment for proof the earth was round. Observation and geometry is all Eratosthenes needed to prove the earth was round. He knew he was right. In exactly the same way we can use geometry to prove afterlife. Eratosthenes’ contemporaries got locked into the idea the earth is flat. They simply would not consider anything different. Today many of us are locked into the idea that afterlife cannot be proven. Just like light falling on the wall, all we need is observation and geometry to prove afterlife. The idea that afterlife cannot be proven is not true. We are going to do it in this section. We will prove what is on the other side of death based on observation and geometry. Proof of Afterlife by Geometry applies geometry to our living situation and proves afterlife. We do it by proving afterlife has to be this way. When Eratosthenes measured light on the wall he knew the world was round because it made sense. The pieces of the puzzle fit together. Proof of Afterlife by Geometry works exactly the same way. The pieces of the puzzle just fit. Then take that dot and make it smaller by one half. Then take that dot and make it smaller by one half again. Now, take that dot, and push it to the limits of smallness. In a sense the dot no longer exists. It has no length, no width, and no height. It occupies no space because it is too small. It is just location. A point, within the context of this discussion, is this perfect geometrical point. Think of it as a tiny point of light within a universe as shown above. A line is like a point in that it has no height or width, however it does have length. You can think of a line as a point that has been stretched in both directions. A line is a row of points, perfectly straight, and infinitely thin. If you looked at a line from one end, it would look like a point. A line is infinite in length but has no width or depth as shown above. A plane is a slice. A plane has length and width, however it has no depth. A plane is a point that has been stretched in length and width but has no depth. A plane is infinitely thin. It has no thickness, only length and width. It is perfectly flat, and infinitely thin. If you looked at a plane from the side, it would look like a line. 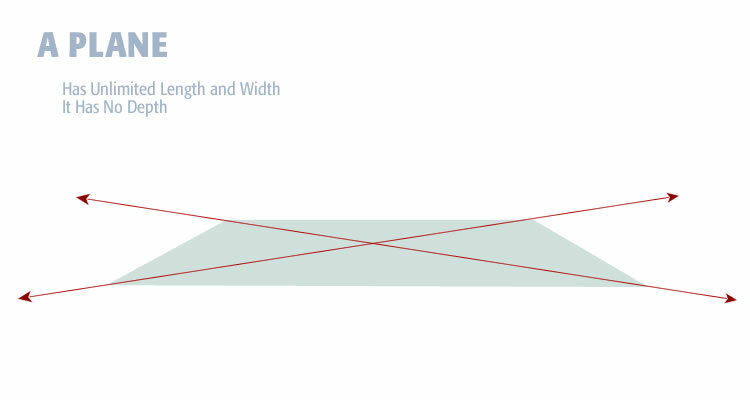 Think of a plane as unlimited length and width as shown above. Space is the opposite of a point. Where a point is infinitely small, without length, width, or height, space is the opposite. Space has unlimited length, width, and height. You can imagine space by standing outside on a dark night looking up at the starts. Imagine space as stretching infinitely in all directions. Space has unlimited height, width, and depth. Think of space as taking the sphere above and expanding it in all directions, infinitely, until is encompasses all of space. Time is called the fourth dimension. Length, width, and depth, coupled with time, form our universe. All three concepts (point, line, space) exist in time. Time is generally not considered when talking about geometry. To understand afterlife we have to consider time too. A point, existing through time, is actually a line. So to redefine a point within the context of time, a point would be a point that exists for just one moment. It would flash and be gone. A point would have no length, width, depth – and it would have no duration. But it exists. It is location, within time and space. 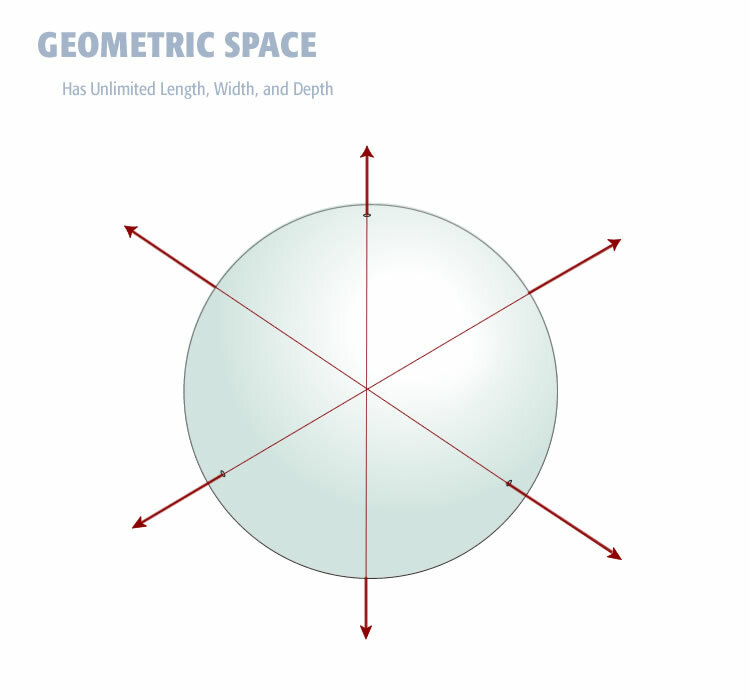 Space existing through time would have unlimited length, width, depth – and unlimited duration. The definition of space, within the context of time, would be everything. It would encompass all length, width, depth, and time. It would have no beginning or ending, in space or time. The concepts defined above – point, line, plane, space, and time – will be used to explain the mathematical relationship between conscious awareness and memory. This relationship proves afterlife. The equation is built using these perfect geometrical concepts.